After seeing its FX volumes rise in January, the CME has posted weak results for February. During the month, total average daily volume (ADV) of futures and options contracts was 769,000, 6.4% below January, and a whopping 28% below the same period in 2013. On a notional value, FX trading calculated to $92 billion per day in volumes. FX trading was easily the worst performing unit at the CME, as every other line of products except for energy had a small decrease, posting gains in activity from January. In addition, other than metals, FX was the only other unit with a year over decrease in volumes. Among bright spots, the CME stated that EURUSD volumes performed well and showed growth from 2013. Specifically, EURUSD options were an outperformer, with the CME reporting 92% year-over-year growth in the product. Forex Magnates reached out to the CME for comment on what may have contributed to the weak month and will update the post with their answer. 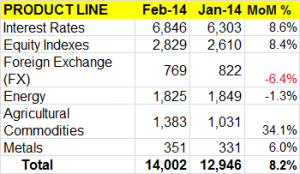 Overall, the CME posted ADV of 14,002,000 contracts traded, 2% above 2013 levels, and 8.2% growth from January. Leading the growth was Agricultural Commodities as well as Interest Rate products whose ADV increased 34.1% and 8.6% respectively during February from January’s data (see below).